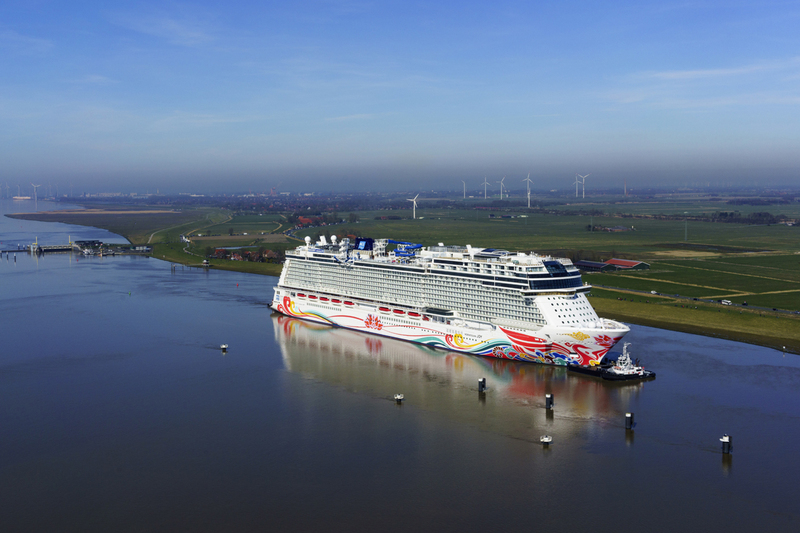 Norwegian Joy, Norwegian Cruise Line’s first custom-designed ship for the Chinese cruise market, began her journey to her home port of Shanghai, China on Sunday, March 26, as she departed the MEYER WERFT shipyard in Papenburg, Germany for her conveyance along the Ems River. Norwegian Joy’s river conveyance marks another key step in the ship's highly anticipated delivery, the cruise line said in a statement announcing the milestone. Measuring 1,094 feet long and 136 feet wide, the ship is the second in the line’s Breakaway-Plus class and the first that was purpose-built for China. “As the first custom-built ship for the Chinese cruise market, she will offer a First Class at Sea experience for our guests,” David Herrera, president of Norwegian Cruise Line Holdings China, said. Norwegian Joy will officially join the fleet in June. The 168,800-gross ton Norwegian Joy departed the shipyard late Sunday evening, making a narrow passage in reverse through the shipyard's locks, passing the structure with just 1.2 meters separating the ship from the "bumpers" installed along the locks. After passing through the sea lock in Papenburg, Norwegian Joy continued along the river, stern first. Due to the strong propulsion in the aft section of the vessel, traveling stern first helps with maneuverability, which is a key component when navigating the vessel through narrow passages such as those along the Ems River. 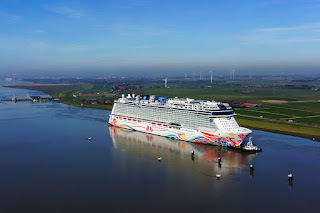 Before reaching her final destination in Eemshaven, Netherlands the following day, Norwegian Joy passed through additional narrow passages including a railway Bridge in Weener; Jann-Berghaus Bridge in Leer and Ems-Barrier in Gandersum. Upon arrival in the Dutch port, Norwegian Joy took on additional provisions and crew members. She will head toward the North Sea for sea trials later this month. Following her delivery to the cruise line on April 27, Norwegian Joy will set sail for China, where she will be showcased through a grand inaugural port tour featuring one-day events at the ports of Qingdao, Shenzhen, and Hong Kong, as well as VIP partner cruises from Norwegian Joy’s home-ports of Shanghai and Tianjin. This unique showcase tour will provide a special opportunity to experience the features that Norwegian Joy has to offer. The ship will be christened at a June 27 ceremony led by her Godfather, ‘King of Chinese Pop’, Wang Leehom. The inaugural celebration in Shanghai will include an exclusive concert and overnight cruise for honored guests. Built at MEYER WERFT shipyard in Germany, Norwegian Joy is Norwegian Cruise Line’s first purpose-built ship customized for the Chinese cruise market. The name Norwegian Joy emphasizes the experience that the ship will offer, a promise that guests will ‘Experience Paradise on the Sea,’ according to the company. Designed to provide First Class at Sea experiences with onboard amenities that cater to the unique vacation desires of Chinese guests, Norwegian Joy will provide a multitude of VIP accommodations including The Haven by Norwegian®, the line’s exclusive, ship-within-a-ship suite luxury complex, which will also include an all-new Observation Deck that features 180 degree views, and a Concierge level, an all-new accommodations category which will provide a VIP experience and feature larger balcony staterooms. Accommodation offerings will also include staterooms designed specifically for families and a multitude of connecting staterooms, for extended families traveling together, as well as a wide array of mini-suite, balcony, ocean view and interior staterooms, many with virtual balconies. Norwegian Joy will offer engaging and innovative activities including a first at sea two-level competitive racetrack, an open-air laser tag course, thrilling simulator rides and interactive video walls at the Galaxy Pavilion as well as hover craft bumper cars, a state-of-the-art racing simulator and two multi-story waterslides. In addition, Norwegian Joy will house a tranquil open space park as well as the line’s largest upscale shopping district with stores ranging from duty-free shops to global luxury brands. Accommodating 3,850 guests, the new Breakaway-Plus Class Ship will debut in China in summer 2017.